Let me just admit up front that they’re more cake than breakfast, unless you can see your way to combining the two–in which case, I assure you, you won’t be alone. The crumb is tender, the tops are crisp with sugar, and the muffins are fragrant with the heady scents of cardamom and vanilla. 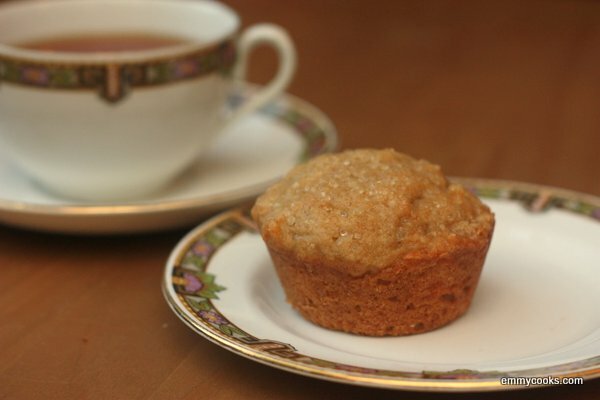 Pear Muffins with Cardamom and Vanilla: In a medium bowl, mix 2 c. flour, ½ tsp. baking soda, 1 tsp. cardamom, and ¼ tsp. salt. In a standing mixer, cream 1 stick (1/2 c.) butter with 1 c. sugar, then add 1 egg, 1 Tbsp. vanilla extract, and 1 ½ c. pear sauce*. Mix well, then stir in dry ingredients just to combine. Transfer to well-greased muffin tins and sprinkle the tops of the muffins with turbinado sugar. Bake at 350. Start to check the muffins after 15 minutes. They are done when a toothpick comes out with just a crumb or two attached. *Make your own pear sauce by piling chunks of peeled pear into a heavy-bottomed pot over medium heat. Cook for a few moments and then decide if you need to add liquid: some pears will produce plenty of their own juice and others will need you to add a few Tbsp. of water or pear juice (or apple juice) to prevent sticking. Cook until pears are tender, then mash them with a fork or potato masher (for a chunky sauce) or immersion blender (for a smoother one). Reduce to desired consistency, then remove from heat. Looks yummy! Love the pic! I have to agree with you about fruit trees. This year our orchard has very little in the way of an apple crop but the pear trees have a nice crop. The weather was perfect this spring when the pear trees bloomed but rainy later when the apple trees were in bloom. Bees don’t go out in the rain so blossoms don’t get pollenated. I’ll be trying your recipe…it sounds terrific. I close my eyes and I can smell the sweet aroma or pears vanilla and cardamom… Perfect for the first fall days! Cardamom and vanilla…perfect pear partners (see what I did there??)! I can almost smell that picture. Nice one! A friend of mine just made pearsauce– which I’ve never made– and I recommended adding cardamom to the sauce, which he did… He also made a separate batch where he added ginger! Two of my fave flavors together… pear and cardamom! Yummy! Intrigued about the cardamom detail in the muffins with the pears. Must try it. Hey, there’s nothing wrong with cake for breakfast. :) I’m so glad it’s pear season–these sound great! pear muffins. i’m officially intrigued – thanks for sharing! Oh, how lovely. These look delicious. We have a rather robust apple tree in our garden, but every year we secretly harvest Asian pears from the long branches of our neighbor’s tree that stretch into our yard. They never, ever pick the fruit themselves (I know! So weird), so I like putting them to good use myself. I’ll have to make these wonderful muffins. Lovely post. A very delicate looking cake indeed. Yum! Looks like you made the most of those few pears! These sound delightful! I envy you your fruit trees, but am happy to use your ideas on fruit I buy at the market. I know the feeling of that customary dozen or so pieces of fruit – for all that waiting! Most years our plum tree gives us about a colander’s worth of fruit. Good for you for making he best of it! Yum! Two of my favorite ingredients (pear and cardamom) encapsulated in one of my favorite treats (muffins! ).